Ocean5 Naval Architects is a leading provider of technical services to the international marine industry. With various projects, this naval architect firm has provides services for a diverse range of custom and production vessels in the private, commercial and government sectors. For more information on Ocean5 you can visit their website here. Ocean5 handled the naval architecture for the company Seakeeper which is a company that set out to revolutionize the boating industry. With their creation of gyro stabilization technology, they have been able to transform the boating industry by eliminating boat roll. 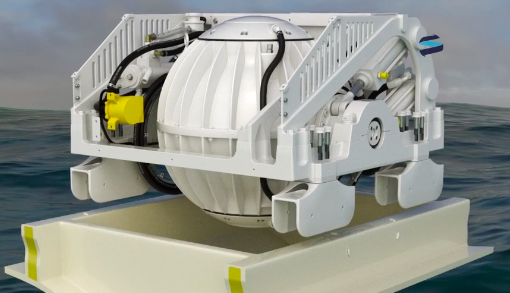 Although they had created the marine stabilizers, we were contacted to support the design, engineering, and fabrication of a fiberglass composite mounting bed used to install this gyroscope. They needed this mounting bed to be able to hold the gyroscope without risking the boat’s ability to stay afloat. To insure the boat’s buoyancy we performed Finite Element Analysis (FEA) simulations on the fiberglass design to test its integrity under multiple mounting configurations and loading conditions as specified by Ocean5. By performing the FEA, we identified areas of high stress concentrations that would contribute to failure criteria under the predicted conditions.The results of the analysis allowed the customer to use the information to make critical decisions on improving the design and specifications of the composite structure to ensure a long service life of the mounting bed. Ocean5 Naval Architects needed a fiberglass composite mounting bed used to install their gyroscope and we here at NLS were able to design, engineer, and fabricate a mounting bed that could withstand boating conditions and requirements. With our advance technology and the use of finite element analysis, we were able to preform simulations that sped up the process of making an accurate model. Not only did we save our customer time and money, but we were able to provide them with accurate and innovative technology.